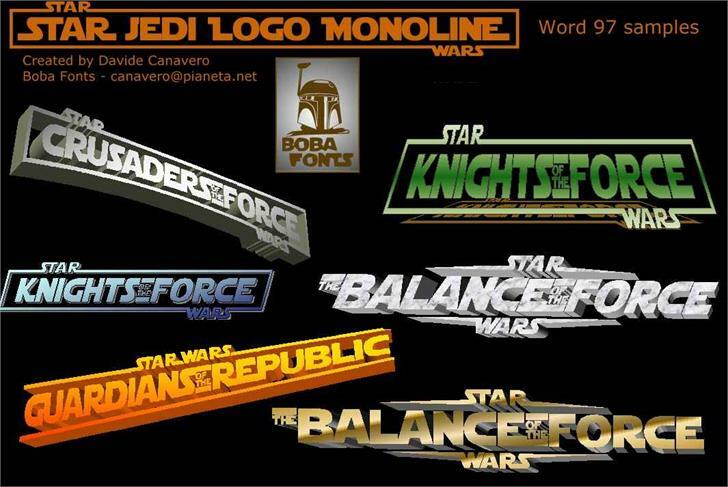 These Star Wars Logo fonts follow the Star Jedi main collection. 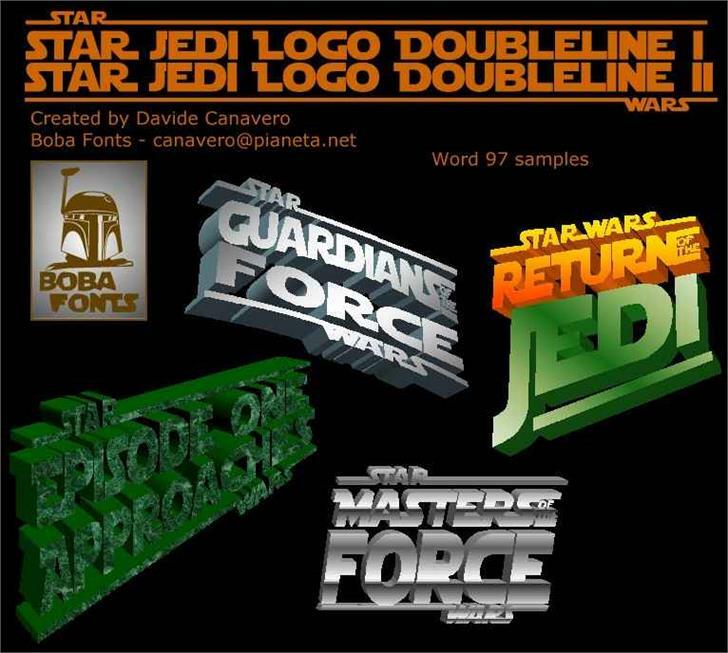 Star Jedi Logo MonoLine & DoubleLine 1 / 2 are titling (capitals only) fonts, with many variations and connections, the same of Star Jedi; they have also the capability to create single or double text lines Logos, in perfect Star Wars style. Here's the new stuff of SJ Logo: Star Jedi Logo MonoLine is provided with special frames, decorative lines, logo fragments that will help you to display the single text line Star Wars-style logo you prefer. SJ Logo MonoLine is fully "compatible" with the basic Star Jedi (I mean you can alternate the two fonts, which differ in a few chars) and it can be used (and framed) alone. Star Jedi Logo DoubleLine 1 is the first (upper) line of the double text line version of SJ Logo MonoLine; its natural complement is SJ Logo DoubleLine 2. This upper font is used as a first text line, and is totally similar to SJ Logo MonoLine, except for the absence of the bottom logo lines and the frames, cause it isn't a stand-alone font, but is meant to be used exclusively with SJ Logo DoubleLine 2. Such a lack of bottom decorative elements is necessary in order to draw up the two fonts' text lines (for the same reason SJ Logo DoubleLine 2 is not provided with top elements). This way, using two separate fonts, you can enjoy the widest range of chars (and all the letter connection possibilities of the basic Star Jedi) for each line of text. When you've finished with the upper text line type ENTER and use SJ Logo DoubleLine 2. Uppercase Q prints as an M! ROUGE KNIGHTS to be outlined but Ive been trying to find the short command to do the outline. NO luck--any help would be appreciated. There appears to be a compatibility problem, this computer's system conducted a verification process, dialog box states a serious error was found and warns against using the font. Disappointment.